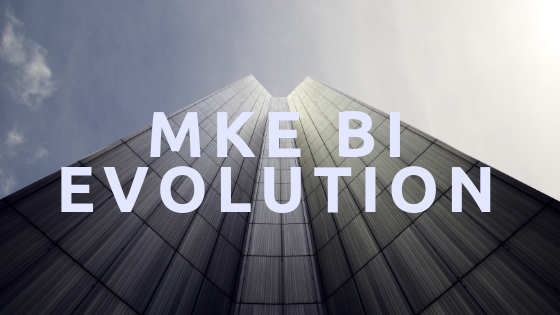 Last Thursday Tableau Software held an event in downtown Milwaukee that brought together business intelligence leaders and practitioners for a series of presentations. Tableau's events in the past have been fairly basic and failed to inspire me personally - instead they seemed to be geared towards newcomers. The event last week was different. The content was phenomenal, the presentations by the selected customers were super cool, and they had liquid chocolate at the happy hour. How could I not love it?! The first person to speak was a man named Josh Rauh from Tableau who spoke about the trends we can expect to see in 2017. Next was Steve Konkol of CUNA Mutual who discussed his Tableau story followed by Jim Webb of MillerCoors who shed light on a particular process. Below are my notes from the event as well as my thoughts. We were an early adopter of this model and it has worked out well for us. We can put the data and Tableau in the hands of the people who best understand the data. When you're in a meeting you should be able to interact with the data and drill in to answer whatever question has come up. Much of this depends on leadership and welcoming an interactive dashboard. If an executive still prefers a printed PDF there isn't much that can be done to interact with your data. We have a pretty amazing setup and acceptance among our leadership, if I do say so. Our analytics practice treats all data equally and typically most of the projects we work on do not use our governed Warehouse data. We've got a project planned to rollout Alteryx to some advanced business users beginning in the second quarter. Again, we're ahead of the curve. We have Tableau embedded into our intranet, wiki, SharePoint, as well as a test Salesforce environment. So many of these trends resonate with me! One of my goals this year is to push the envelope of what we can do with data, but also create an Analytics Center of Excellence to enable an even greater use of data. That said, you can't really be on the cutting edge if you're busy with the mundane. So it's extremely important to get to the point where business users are mostly self-service. I am looking forward to seeing how Tableau might build this into future releases. I know of Narrative Science and their Chrome extension that works with Tableau, but it doesn't allow a user to speak commands. Instead it summarizes your data in paragraph or bullet form. Tableau has data connectors to your standard cloud providers and offers a product called Tableau Online which is their hosted server option. There are many tools available that make advanced analysis of your data easier to execute and without the need to know certain programming languages. I question how far those tools could get you, though, as many data science programs still use R and/or Python for good reason. You should be able to understand what is happening to your data if you are going to need to explain the results of your analysis. Compared themselves to the Hulk. They wanted to change due to insatiable demand for data, current tools were not scalable, and lack of agility. It was taking too long to produce reports and then the reports were stale. Not sustainable. Transformed organization with daily Tableau dashboard that have been automated and no longer have a need for reconciliation. Standard and simplified reporting with self-service capabilities that are scalable and agile. On premise consumption (bar/restaurant) versus off premise consumption (grocery store) purchase points. Focusing their efforts on bars or restaurants because that's where consumers find brands and fall in love with brands. Before: variety of reports that each focus on a single metric across the entire universe that is a large spreadsheet. Goal: each sales rep has an iPad and are empowered to use data. Make data mobile and distribute it quickly. Easily determine what brand is at risk while adding value to the outlet by presenting market data. After: speaking the same language and measuring the same goals, addressing the right priorities, more engagement. Each presenter tied their presentation back to the BI Trends discussion as well as provide some sort of personal impact story. I appreciate the thoughtfulness that connected each presentation together and allowed for a natural flow to the event. Were you at the event? Do you have anything to add that I might have missed? Comment below! "Tableau is a company that measures beer sales."